Tickets for the rematch of Carl Froch vs. George Groves has been sold out, 60,000 tickets went on sale at lunchtime and all of them were sold within an hour. That will better the 57,000 that saw Ricky Hatton beat Juan Lazcano in 2008, a post-war record for a British fight. Tickets for the eagerly-anticipated rematch went on sale at midday on Monday, and the demand for a chance to be in Wembley on May 31 was so great that the ticket supplier’s website crashed within minutes. The first batch of 60,000 tickets for Froch v Groves II sold out inside an hour of going on sale and Wembley is heading for the biggest crowd in British boxing history. Promoter Eddie Hearn will be holding talks with Transport for London in hopes of being able to agree to market a further 20,000 seats before the bout takes place on May 31. There is a minor issue over an earlier first bell time to help late night exit from the stadium is not likely to prevent Carl Froch and George Groves surpassing the 70,000 attendance for Jack Doyle and Jack Petersen heavyweight bout in 1933. A crowd of around 70,000 is expected to flock to the capital for what will be the first fight at the stadium since it re-opened its doors in 2007. Speaking to Sky Sports on Tuesday, Froch said: “For me to be involved in an event like this is a very proud moment. “With it being in the capital city as well, it just makes the whole history of the event phenomenal. 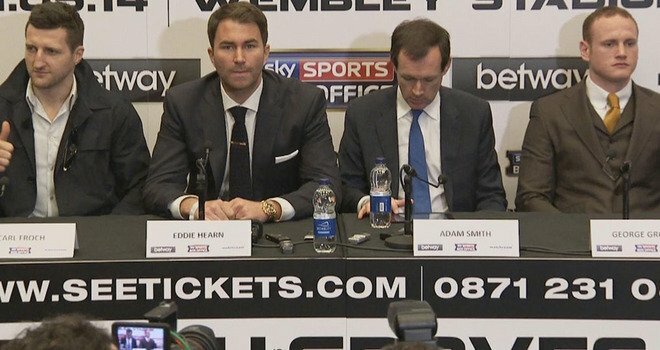 Promoter Eddie Hearn added: “Ever since I walked out at Wembley I knew this was the one. “Logistically we had some hurdles to overcome but the support of Wembley, The FA and Sky Sports have helped make history here.